On the first Friday of each month we offer our Friday Night Liftoff at 6:15pm (FNLO), LBT’s monthly Shabbat Evening Service filled with music, energy, reflection, and soul. Featuring a group of LA’s finest professional musicians, Friday Night Liftoff will make your spirit soar, as worshipers from all corners of our community – from singles to seniors, from parents to preschoolers – come together to raise their voices, search their hearts, and discover the deep renewal that only Shabbat can offer. This is the kind of service Angelenos will be talking about, so be a part of it from the beginning! When the busy week comes to an end, join our Shabbat Evening Services on the third Friday of each month at 7:30pm – and experience the gifts of restoration, gratitude, and soulful self-exploration. With music that will open your heart, poetic words of prayer that will inspire your spirit, and insightful teachings that will engage and challenge your mind, these services are the perfect way to seek meaning, perspective, and vision that will carry through the week ahead! During months that have a fifth Friday, we will offer a regular Shabbat Evening Service at 6:15pm. In the summer, Kabbalat Shabbat services are held under the stars in our extraordinary Outdoor Chapel. These services meet at 7:30pm and are often preceded by community picnics. They include a short sermon or teaching and are outdoors and include the D’var Torah (short sermon). Click here to listen to mp3 (audio) files of the various components of the Kabbalat Shabbat service. Shabbat does not end after the Oneg on Friday nights. Be part of our Shabbat Morning Minyan, as we meet at 9:30am on the second and fourth Saturday of every month. Our clergy will join with members of the temple community to create an informal, musical, spiritual and intellectually stimulating Shabbat service. A potluck Kiddush lunch will follow each service. 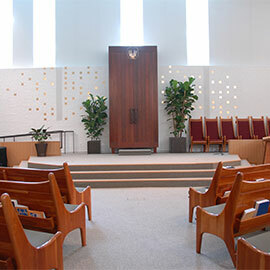 Shabbat morning services are also held Saturdays at 10:30am in the main sanctuary on weeks when B’nai Mitzvah are celebrated. Kaddish is offered at each of our Shabbat services for anyone who would like to commemorate a loved one. Our temple-wide initiative, introduced in November 2015, will help all members of our community experience Shabbat in a completely transformative way – reaching in, reaching up, and reaching out. Initially, we will have to challenge what we have long-understood Shabbat to mean – in theory and practice – and re-educate ourselves about how we view Shabbat at our temple and in our lives. To participate fully in our 25 Hours of Shabbat events go to this page.